The professional context has become an increasingly important component of German tests in recent years. This has been driven in particular by companies that wanted tests that would certify a person’s language proficiency not only in everyday situations but specifically for use at the workplace. Some of these tests have already become established. Initially it was primarily German companies with branches abroad that wanted to see a new kind of German tests – tests that focused on language proficiency in a business context. The firms in question were keen to ensure that when spending time in Germany their employees would have the necessary German language skills to cope not only with everyday situations, but also and more importantly at the workplace. As hundreds of thousands of migrants and refugees have arrived in Germany since 2015, demand for this kind of German test is even greater within Germany than it is abroad. Businesses hope that these migrants and refugees will fill the many vacant jobs and apprenticeship places. However, this requires them not only to meet the necessary technical and professional requirements but also to prove that they have a sufficient command of German to work in their desired profession. There are two types of tests that demonstrate language skills in the professional context: specialist and work-related tests. Specialist language tests attach great importance to the knowledge needed in a particular field. This is reflected in the vocabulary and language structures. Such tests already exist for medical and nursing professions. "These tests are often very demanding in terms of their content", says Michaela Perlmann-Balme, an expert in language test development at the Goethe-Institut. "They require teachers who understand the content, not to mention examiners who are experts in the relevant fields." As Perlmann-Balme explains, this is why specialist tests are not as common as tests that deal with general situations in the professional context. These are known as work-related language tests. They test everyday language in professional situations, e.g. expressions that are important in many different professions. Examples of work-related language tests include the DSD I PRO, the telc Deutsch Beruf and the Goethe-Test PRO. 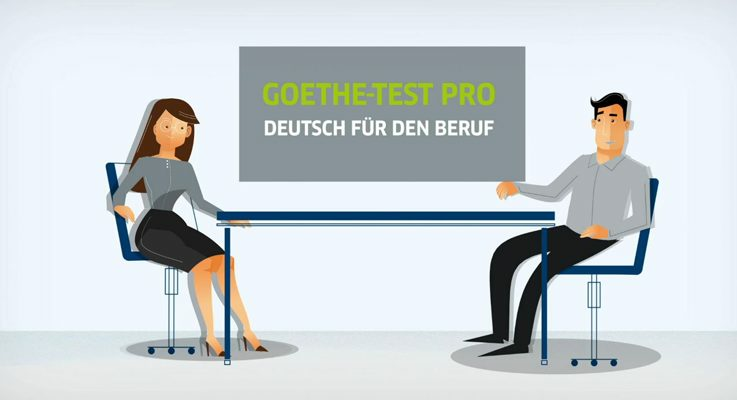 The work-related language test offered by the Goethe-Institut is computer-based. An online test, it is taken using the Moodle learning platform on a computer, laptop or tablet at one of the Goethe-Institut’s test centres. The test result can be accessed in the form of a digital certificate after the 60 to 90 minutes that it generally takes to complete the test. The test is adaptive and covers all levels from A1 to C2, which means that the test always starts with a question of medium complexity. Depending on the answer given, the following question will be either harder or easier. An algorithm generates questions that match the language level of the participants until a valid statement can be made about their language proficiency. "The test is a quick, reliable and flexible way of testing listening and reading comprehension abilities in a professional context", says Katharina Klein, testing expert at the Goethe-Institut. The results are calculated automatically and the final score is available as soon as the test has been completed. One major advantage is that participants cannot fail the test as it is individually adapted to their specific language level. The Goethe-Test PRO is based on communication in the world of work, for example in an office. Typical situations covered in the test include placing orders, meetings, applications, scheduling appointments, break-time chats and situations involving communication with superiors, colleagues or service providers. "For example, participants read a business e-mail exchange about scheduling an appointment and have to answer multiple choice questions, answer questions to show that they have understood job vacancy adverts, or listen to a brief lecture on a work-related topic and then answer comprehension questions", explains Klein. "All eight types of exercise feature in the demo version which anyone interested can use to prepare for the Goethe-Test PRO." Because the Goethe-Test PRO is run on the Moodle learning platform, the test site is flexible. Individuals who wish to apply for a job and quickly need proof of their spoken language proficiency can take the test at branches of the Goethe-Institut worldwide or at test cooperation partners. The result of the test, including a certificate, is available as soon as the test has been completed[KK1] . Companies in Germany or abroad can be trained by their local Goethe-Institut to run the test themselves, which allows them to test the German skills of applicants or staff on-site. [KH2] The test is already being used at vocational schools abroad, such as at the ROC schools in the Netherlands. Before starting a job, school-leavers in all kinds of different fields there use the Goethe-Test PRO to demonstrate their German skills – supplemented by written and oral communication modules that contain questions relevant to their chosen professions. telc GmbH, a subsidiary of the German Adult Education Association (DVV), provides language tests for immigrants in Germany. The integration of immigrants into the world of work is one of the primary goals of the company, so telc offers specialists tests for the nursing and medical professions, as well as work-related tests at various levels. The telc Deutsch Beruf tests are available at levels A2+, B1+, B1-B2, B2+, B2-C1 and C1. For two years now, the telc Deutsch B1-B2 Beruf has been used as a final test for the work-related language courses that many immigrants attend after completing an integration course. They are structured in the same way as the Deutsch-Test für Zuwanderer A2-B1, which is taken by tens of thousands of immigrants each year at the end of their integration courses. They comprise a listening comprehension, a reading comprehension, a writing test and an oral examination, as well as a language elements part that tests vocabulary and grammar. The tests focus on general work-related situations such as applications and handling of offers, enquiries and complaints, as well as small talk with colleagues. Based on the Deutsches Sprachdiplom I (DSD I), the Central Agency for Schools Abroad (ZfA) has developed a work-related test for young adults aged 16 and above: the DSD I PRO of the Standing Conference of the Ministers of Education and Cultural Affairs. The test is geared towards young adults wishing to work in a German-speaking company or wanting to begin a course of dual education. It is used not only abroad but also at vocational schools within Germany, as many young refugees and migrants attend special remedial classes there that are designed to give them the language preparation they need to begin an apprenticeship. They take the DSD I PRO at the end of the remedial classes, and often before deciding on a particular apprenticeship. Like the more general DSD I, the work-related version also tests four areas of ability: reading comprehension, listening comprehension, written and oral communication. "The main difference as compared to the DSD I is the content, and the fact that the language activities focus on different areas", says Dr Wassilios Klein from the Central Agency for Schools Abroad. "While the DSD I is designed for a younger target group, with topics relating to the family, free time and school, the questions in the DSD I PRO test relate to different jobs, choosing a profession, having a career or doing an internship." One example: in the oral communication part of the test, the young adults talk about themselves in the style of a job interview and then give a presentation of a work-related topic that they have prepared at home. This might involve presenting a company or their dream job, or reporting on an internship they have done. As Klein explains, the target level is B1 even though the test is scaled to cover both A2 and B1 levels. "The youngsters begin their apprenticeship at B1 level and ideally should reach B2 level during their training." He goes on to say that this requires them to attend German courses at the same time. Like other school examinations, the DSD I PRO is taken once a year. Im April 2018 wurde die Prüfung zum zweiten Mal in Deutschland und zum ersten Mal im Ausland durchgeführt. Mit Erfolg, so Klein. [KK3] "We often hear that pupils have succeeded in finding an apprenticeship place thanks to the DSD I PRO", says Wassilios Klein, er adding that the test is also recognized by business associations and chambers of commerce and industry. "Work-related tests have a very motivating effect", believes Klein. "The youngsters see that they are learning something that is genuinely useful – and this is particularly true of 16- or 17-year-olds who are about to embark on an apprenticeship." Katja Hanke is a freelance journalist in Berlin.